Habit: Annual, perennial herb. Stem: generally ascending to erect, 2--20 dm, generally tufted, +- solid in ×-section. Leaf: generally basal; cauline few, ascending or curving away; distal sheath margin and collar glabrous or hairy; ligule < 1 mm, hairy or membranous, fringed; blade flat to inrolled, generally glabrous or scabrous, occasionally short-soft-hairy. Inflorescence: terminal, also occasionally axillary, panicle- or spike-like, generally partly enclosed by sheath; branches spreading or appressed. 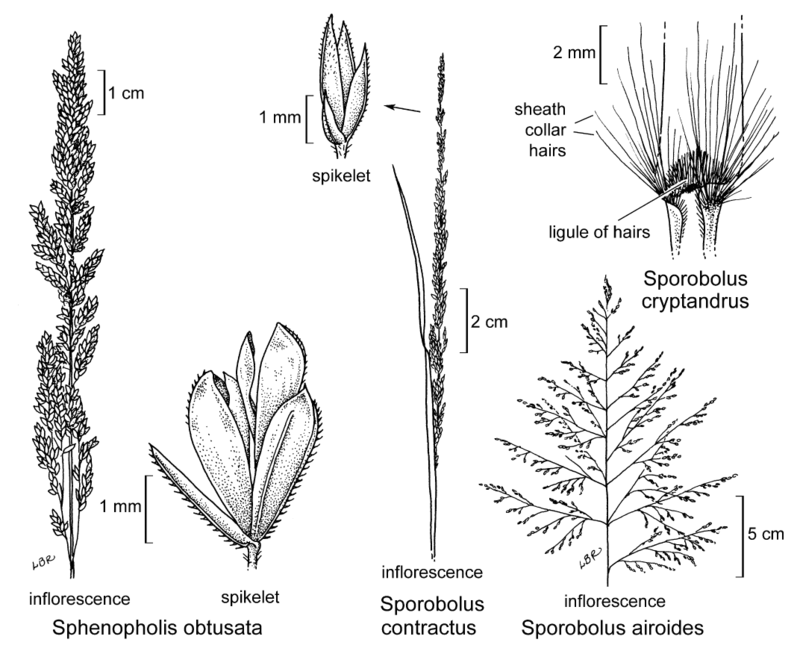 Spikelet: < 6 mm, generally pale to gray-green or +- purple; glumes generally unequal, upper < or > lemma, membranous to translucent, 1-veined; floret bisexual, generally breaking above glumes; lemma texture generally like glumes, 1(3)-veined; palea < or > lemma. Fruit: utricle-like, when wet gelatinous with seed emergent from split ovary wall. Habit: Perennial herb. Stem: tufted, erect, 3--10(12) dm. Leaf: base dull, green to brown, margin glabrous or ciliate, collar with conspicuous hairs to 4 mm; ligule < 0.5--1 mm, fringe hairs to 4 mm; blade 5--25 cm, 1--6 mm wide. Inflorescence: generally terminal, exserted to sheathed completely, spike-like initially, generally pyramid-shaped at maturity, open; 1° branches ascending, lowest generally > 3 cm, > internodes, 2° weakly spreading or appressed, bearing 3°, spikelets to near obscure base. Spikelet: 1.5--3 mm, green to purple or lead-colored; glumes narrowly lanceolate, tip acute, unequal, lower 0.5--1.1 mm, upper 1.5--2.7 mm, > 0.6 × lemma; lemma 1.5--2.5 mm, glabrous, ovate to lanceolate, tip acute; anthers 0.2--1 mm. Fruit: 0.7--1 mm, ellipsoid, striate, light- to red-brown. Chromosomes: 2n=36,38,72. Synonyms: Sporobolus nealleyi Vasey, misappl. from San Luis Obispo Co.
Unabridged Note: FNANM 25:131 places Sporobolus nealleyi Vasey in San Luis Obispo Co. However, the only collection there (San Miguel, Keil 18434, OBI36541!) is Sporobolus cryptandrus. Seeded for erosion control or revegetation. Citation for this treatment: Michael Curto 2012, Sporobolus cryptandrus, in Jepson Flora Project (eds.) Jepson eFlora, http://ucjeps.berkeley.edu/eflora/eflora_display.php?tid=45299, accessed on April 19, 2019. SNH, SnGb, SnBr, PR, SNE, D, naturalized CaRF, ScV, waif in SnJV, SCoRO, SCo; Markers link to CCH specimen records. Yellow markers indicate records that may provide evidence for eFlora range revision or may have georeferencing or identification issues. Purple markers indicate specimens collected from a garden, greenhouse, or other non-wild location.